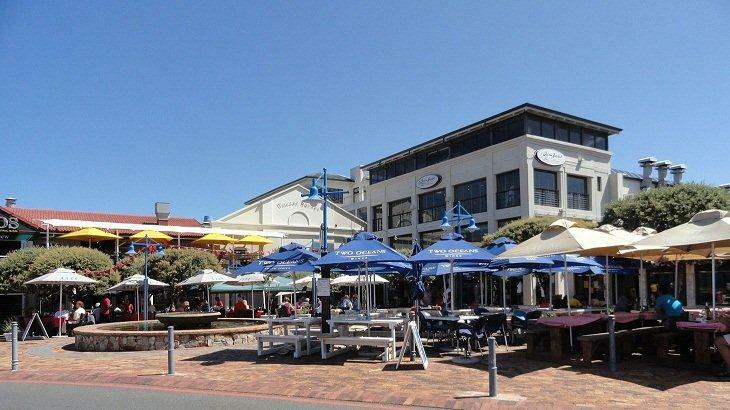 Above and beyond the chain store restaurants in Hermanus like the Wimpy, KFC, Steers, Simply Asia, Ocean Basket, Col’Cacchios and Debonairs etc, Hermanus has a plethora of restaurants that are only found in this seaside town. We’ve briefly described a few of the types of restaurants you can find in Hermanus along with a list of contact details. We shall be happy to give you more information and make reservations on your behalf during your stay at Eastbury Cottage. During the Winter months, many of these restaurants run specials such as “order one, get one free”, or there are added incentives like a free glass of wine, no corkage or a starter to the meal. Specials usually begin towards the end of April and go through May and June into July. Sometimes even August brings a special or two to the dining table. LB Seafood Bistro looks after its pensioners on a Thursday where you can eat off the R100 per meal menu or buy one get one free out of peak season. Char’d Grill and Wine Bar bookings@chardhermanus.co.za tel 028 3121986 Shop no 4 Village Square Market Street, Hermanus. Fisherman’s Cottage, located in the courtyard just in front of the Village Square. All fish is fresh, tastily prepared and very reasonable. The restaurant, with a great atmosphere and lovely staff, does only has about ten tables, so booking in season would be advised. 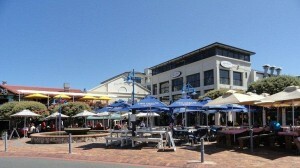 LB Seafood Bistro in the Village square is a firm favourite with wonderful views of Walker Bay. Yes, that is from where I saw my first whale of the season jumping in the bay! It is situate on the first floor of the Village Square…take the lift if you don’t like the stairs. Bientang’s Cave down on the rocks below Marine Drive is also a great place to have lunch or dinner. Sadly, award winning restaurant Bs Steakhouse and Grill burnt down last year but you can find Bruce doing his magic at La Vierge on the R320 Wine Route in the Hemel-en-Aarde. Enjoy Italian Food? Hermanus is lucky to be home to two top-grade Italian restaurants. Rossi’s, found in High Street, prides itself in being Hermanus’ oldest Italian restaurant as well as is continued use of a unique wood-fire oven. Running since 1985 Rossi’s is a reasonably priced, family restaurant with a lively, friendly atmosphere, excellent food, great service and outstanding value. The next authentic Italian restaurant is Fabio’s Ristorante Italiano, situated just off the Main Road as you reach the CBD of Hermanus from Cape Town’s side. Fabio’s Ristorante with its added quaint sidewalk tables in St Peter’s Lane is a genuine Italian Restaurant owned by true Italian, Fabio. Also family friendly, Fabio’s has many specialties to keep your taste buds satisfied. Coffee shops/light meals. Hermanus has a great range of quaint little coffee shops that all sell great little bites to eat. One of the popular coffee shops to go to is Oskars, situated in opposite the Red Sheds in Market Square. The menu is versatile and exiting, the staff is friendly and it’s situated in the middle of town so it’s not out of the way. While not a coffee shop, Coco’s cocktail lounge also has a great range of light meals and a great cocktail menu for those nights when you want to sit on top of the world and watch the sun set over the ocean. La Vierge, Sumaridge and Heaven offer restaurants in the Hemel en Aarde Valley along the Wine Route where you can enjoy wine tasting and delicious meals at the same time. Celebration functions and small wedding receptions are also catered for at La Vierge. Farm house cooking is at its best at Mogg’s Country Cookhouse also found on the R320 in the Hemel en Aarde Valley. Gourmet. For those who want to spoil themselves to a fancier meal, there’s the Marine Hotel restaurant. With exquisite food and an even better view of the ocean this restaurant is definitely the place to go to spoil yourself. Likewise, Burgundy restaurant, found just on the tip of Harbour Road, also has a great view of the ocean and a more sophisticated menu, although kids’ meals are also offered. With a sea view. Many of the restaurants and coffee shops have a sea view but the best place to look is around the Village Square. A cluster of restaurants and coffee shops housed here, give a wide variety of good food with an even better view. There’s also Dutchies and Milkwood, two restaurants situated on Grotto Beach and Onrus Beach respectively. These two restaurants cater for the needs of the hungry beach-goers, those looking for a view of the spectacular ocean and everybody in between. Spoilt for choice: Virtually every restaurant in Hermanus has a menu with different options; even the Italian places offer seafood for those in the mood. It’s a good idea to have a quick look at the place’s menu if you’re uncertain but it’s a slim chance that the menu will be very restricting, no matter where you go. A restaurant I have found that serves a great variety of amazing food is Tapas, situated just across the car park from the Village Square. While rather small, Tapas has a great atmosphere and a menu that caters for the adventurous, the meat-lover, the vegetarian and those who prefer firm favourites like chilli poppers! We shall keep this list updated for your convenience. 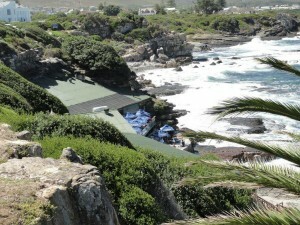 Soul Cafe (Opposite Marine Hotel) +27 (0)28-3132137 Wonderful Friday night live band music! Rock till you drop!